It was mainly a day of rest. Brad and Anders rolled into the condo about noon. Brad brought in the pork and put it in the freezer. Both boys took showers and I started a load of laundry. 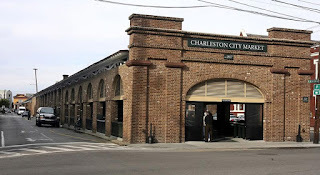 Katie and I went downtown Charleston to check out the Historic Charleston City Market. Friend Jessica recommended a stroll. We went to a good lunch spot (recommended by a woman on the street) called Another Broken Egg where Katie had the best chocolate milk of her life (complete with whipped cream) and I had a yummy BLT with avocado. We bought some grits for Brad and some taco clothing for Anders. Then we walked to St. Michael's Church in downtown Charleston. Back to the condo where we tried to take a dip in the pool--way too cold. I then walked the Arthur bridge while the rest of the family stayed back and relaxed. I walked about 4 miles in total and really tangled my hair with the very high winds. Now we're watching some Fixer Upper and will soon wake Brad and see if he wants to go to dinner with us.